MultiAxis part-making involves some of the most complex machining strategies that exist in CAD-CAM. This is why Multiaxis CNC programmers turn to BobCAD-CAM software to program out the toolpath strategies in order to create the right NC programs. 4 & 5 Axis Indexing, Trimming and Simultaneous Machining requires advanced toolpath operations that can be found in the latest v26 5 Axis Mill Pro CAD-CAM. Examples of industries that need this technology are CNC manufacturers that machine impellers, turbines or automotive applications that include CNC porting among others. 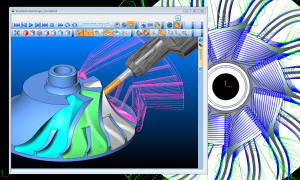 The latest BobCAD-CAM v26 Multiaxis CNC software provides the advanced surface-based machining strategies that take complex programming and simplify it down to wizard driven machining features that get it done. These toolpaths include Undercutting, SWARF and Flow Machining that are just 3 of the 9 new surface-based toolpaths that are available in BobCAD-CAM 5 Axis Mill Pro software now. The software makes it easier to create the right toolpath for simultaneous impeller roughing and finishing as well. The software steps you through the part definition that include floor, wall and ceiling surfaces, Strategy Patterns and the Depth Steps necessary to create the right slices and depths to create the most efficient toolpath for the part. The process includes High Speed machining options where the tool engagement is automatically calculated. These toolpath machining operations also take into consideration the area REST Roughing options, cut sorting to determine the direction you want, tool maximum step-over and cusp height as well as surface quality cut tolerances and toolpath linking options. Below you can see an example of the “Morph Between 2 Curves”. The Morph Between Two Curves feature creates a morph toolpath between two leading curves. Morph means that the generated toolpath gradually interpolates between the two curves and it is evenly spread over the surface. This option is very suitable to machine steep areas for mold making. The software also provides the 3+2 toolpath capabilities for Indexing and Trimming. The High Speed machining capabilities that come with the Adaptive Roughing are designed to raise the bar in high speed machining and deliver a powerful solution to the complex machining processes. The New v26 Multiaxis Pro modules are the first in the world to offer multiaxis Adaptive High Speed Machining for this level of CNC machining. The same high speed attributes and characteristics exist for multiaxis high speed machining as they do for 3 Axis. This means the tool is constantly engaged in the material, taking advantage of deeper cuts while using a higher percentage of the cutting tool at higher speeds. Only this time, during full simultaneous 5 Axis motion. In addition, multiaxis machine toolpaths aren’t only for 5 Axis anymore. These toolpaths are also highly effective for use with 3 Axis part programming. 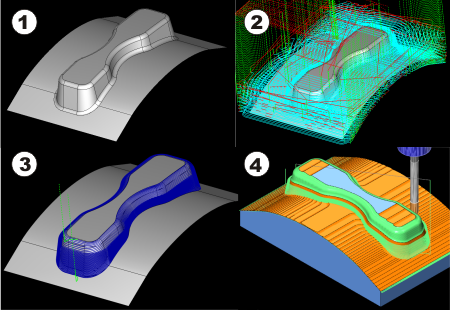 The example below shows how the BobCAD-CAM 3 Axis advanced roughing toolpath was combined with 5 axis roughing to create a flow path for machining the example part. This is an effective way to use 5 axis toolpath for programming 3 axis parts efficiently. 5 Axis CAD-CAM software provides powerful machining capabilities to help make complex multiaxis machining simple. Read about how in this article. looking for a quote on 5 axis seat and lathe. I put in a request for someone to reach out to you! Or, feel free to call us.